We have a Megan Fox sighting, as the gorgeous brunette was promoting the upcoming “Teenage Mutant Ninja Turtles” at Comic-Con in San Diego. The red carpet was invented for women like her. Megan claims she’s a fan, so you fanboys now have something to talk about with her! Which is not to say that the search for the great themed cocktails to be found in Comic-Con’s backyard was an easy one. At times I and my photographing buddy, Rodney Reynaldo, feared we might not have enough drinks to really make this piece sing but, as we trudged through what seemed like every bar in San Diego’s downtown Gaslamp district, we found plenty. Admittedly, we sometimes found ourselves making the news as much as we reported on it; some of these drinks are on the spot creations from some of the area’s more spontaneous mixologists. Still, most of these were created with plenty of forethought, most of them tasted good, and some were downright terrific. I have to admit that I pretty much knew somebody would come up with an extremely sweet red, white and blue themed salute to good ol’ Cap. I never imagined it would induce near terminal brain freeze while tasting far better than this cocktail snob would have ever expected. The Captain America, as crafted by Andrea of the Hard Rock Cafe on 4th Avenue, is actually three drinks. The blue is a pina colada featuring Blue Curacao; the red is a raspberry pina colada featuring Bacardi rum; and the white, and possibly the best tasting of the three, was an exceedingly sweet frozen daiquiri made with Bacardi’s Dragon Berry Rum. A million miles away from a classic daiquiri like I’d make, but what would I expect from a red, white and blue cocktail? The Tivoli, which proclaims itself the oldest bar in San Diego, sticks to its old school image by an affinity with a certain reactionary-leaning caped crusader. 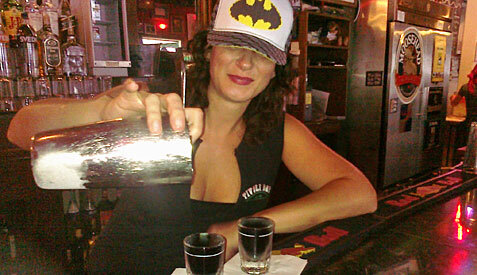 The Dark Knight, crafted by the bar’s redoubtable Rosie (pictured uptop), was as dark as any black knight but it’s flavor might have pleased a fruit bat with it’s surprisingly refreshing combination of vodka, blue curacao, raspberry liqueur, and a splash of Rumple Minze 100 proof peppermint schnapps. There are any number of green drinks named in honor of Bruce Banner’s ill-tempered alter-ego. Yet, it’s hard to imagine any would ever be tastier than this concoction. Whipped up on the spot by the very skilled Oscar Avila of El Vitral, the Spicy Hulk reflected our location just a few miles from the Mexican border with healthy dashes of cucumber, cilantro, serrano peppers, tomatillo, lime juice, agave nectar and, of course, blanco tequila. Nothing puny about this one. We came to the Gaslamp in search of themed cocktails. We found our first themed bartender in Harlo Stompro of the brothel-esque 5th Avenue watering hole and restaurant. 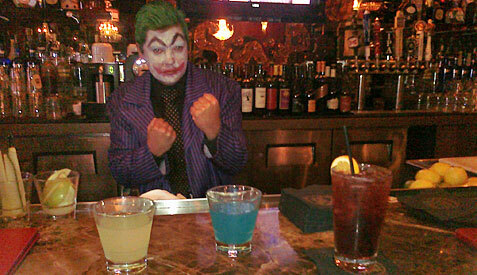 The man might be a joker, but he certainly took the time to come up an assortment of con-friendly libations. The Alien Secretion contains vodka, both Rose’s Lime Juice and fresh lime, and triple sec. The bright green Romulan Ale might please Trek fans with a yen for another slight twist on a Kamikaze with blue curacao, vodka and fresh lime. The Darth Vader is an homage to a Long Island Ice Tea with vodka, gin, rum, sour mix, and Chambord sitting in for the traditional triple sec. Since I kind of hate Long Islands, I found the taste appropriately evil. The upcoming action drama “Warrior” is the first truly major movie we can think of to cover the world of MMA. A poster from Comic-Con signed by stars Tom Hardy — who made such a huge splash as Eames in “Inception” and who is slated to be next Mad Max — and Joel Edgerton (outstanding in last year’s “Animal Kingdom“) from Comi-Con is currently up for auction at eBay. It’s all for an outstanding cause, the Elizabeth Glaser Pediatric AIDS Foundation, so you’ll be getting a small piece of history while helping children. However, the auction closes this afternoon (Thursday, 8/4), just a couple of hours, so there’s not much time. This September marks the long-awaited release of all six “Star Wars” films on Blu-ray, and one of the cooler special features to be included in the nine-disc set are deleted scenes from the original trilogy. Attendees at this year’s San Diego Comic-Con were treated to a brief montage of the footage yesterday, but 20th Century Fox has now decided to share it with all those fans who weren’t able to make it out to the annual geekfest. To be honest, it’s not as revealing as I would have hoped, but it does whet my appetite for the upcoming Blu-ray release. And really, wasn’t that the point?